This is truly a joyous day in the short (but illustrious) reign of West BY GOD Virginia. 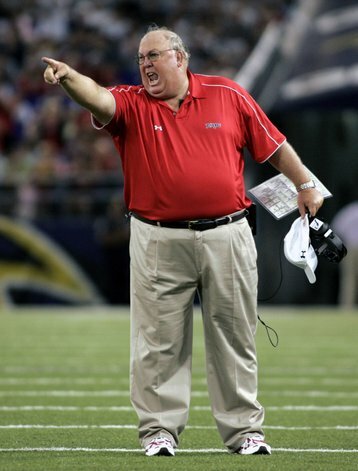 Today, we are proud to bring you an exclusive interview with Maryland Head Coach Ralph Friedgen. This is a major coup for us, so I hope you’re excited about it as I am. Enjoy. Charley West: First off, Mr. Friedgen, thanks for taking the time out of your busy schedule to sit down with us. For a fledgling college football blog, this is a really big honor. Ralph Friedgen: Not a problem, glad to be here. CW: Now Ralph, what are your thoughts going into this Thursday’s nationally televised home game with the West Virginia Mountaineers? RF: I think I was promised lunch. CW: Yes, sir, lunch is on its way. They’re usually pretty punctual. RF: No, I know I was promised lunch. CW: As I said, lunch is on its way. Roasted chicken on a bed of fettuccini alfredo/chocolate cake, right? CW: It might not look like much, but these seats are actually leather, so if you could just avoid drooling on them. RF: Why are we doing this in your car again? CW: Moving on… Like I said coach, what are your thoughts on the game this Thursday? RF: Well, if I remember correctly, we won 3 out of 4 quarters last year, so I feel pretty confident this year. CW: Yes, I remember you saying that after the game. But you lost that first quarter 123-10. CW: Even so, you guys got blown out. RF: Yeah, but now that Pat White and Steve Slaton have graduated, we should be fine. CW: Actually, Ralph, both White and Slaton are back this year. In fact, they’re still just juniors. CW: Excuse me, I’m not done yet. As I was saying, he rushed for 1128 yards as a true freshman. Last year, as just a sophomore, he ran for 1744 yards and finished 4th in the Heisman voting. This year, he was a pre-season All-American and front-runner for the Doak Walker and Heisman throphies. CW: Well, Ralph, in hindsight, do you think it was a good idea to pull Slaton’s scholarship? CW: Yeah, I didn’t think so either. RF: In my defense, we really needed to clear a spot for RB Morgan Green. CW: How has he done so far? RF: Hasn’t played a down. CW: Good call on that one Ralph. OK, let’s switch gears. How pumped do you think Byrd Stadium will be on Thursday night? RF: Pretty damn pumped. Maryland has the best football fans in the country. RF: No. That’s a lie. CW: Yeah, that makes more sense. RF: Probably like the 80th best fans. Wait, is North Texas good this year, because that could make a difference? CW: Ralph, they play in the Sun Belt. RF: Even so, I hear good things. CW: For someone who has been so arrogant about Maryland football and your own coaching abilities in the past, this is certainly a change in tune. RF: Yeah, that was all smoke and mirrors. I actually faked a good deal of my resume. Remember where it says I worked as quarterbacks coach for the Chargers? RF: Yeah, I was actually in prison. I don’t really want to get into it. CW: You know just admitting that will probably get you fired? RF: You think they’ll do it before Thursday? I really don’t want to play the Mountaineers. Big round of applause for Ralph Friedgen for agreeing to the interview and putting little ‘ol West BY GOD Virginia on the map. Yes, I know that the title of this post is lame. But, I gotta work up my detest towards all things Maryland. So, that includes Under Armor. Before we get into the Terps, lets take a quick stroll back to last week. Well, it won’t be a long one. I went camping this past week and could only listen to the game. So that means you will have to rely on Charley Vest’s post for a wrap up. By the way, ladies, did you catch that Charley Vest wears polo shirts to football games? Yes, he’s a bit of a dandy. In addition to Vest’s summation, the one thing I’m getting troubled with is Pat White’s potential overuse running the football. Whenever Rod gets a little concern, he goes to White on a sweep or a draw. While White’s a great security blanket, he has got to be healthy for Big East games. Now that I have that off my chest, let’s move onto the Terps. Since Ralph Friedgen came to Maryland and turned around the program, I really, really have not liked Maryland. And with Virginia Tech deciding they would rather play a scrub team than West Virginia, Maryland has top billing on the non conference slate. Well, that is until next year when they take a ‘break’ on the series. So, West Virginia must do the only proper thing. Crush ’em. Note: Friedgen not depicted to actual size.